Rather than offering Western comforts at great expense, the best African safaris allow you to embrace the simplicity of the bush. Signatures of this kind of safari include the smoky taste of coffee brewed over the campfire before an early morning game drive; and the scent of hot canvas cooling as you climb into your tent at the end of the day. 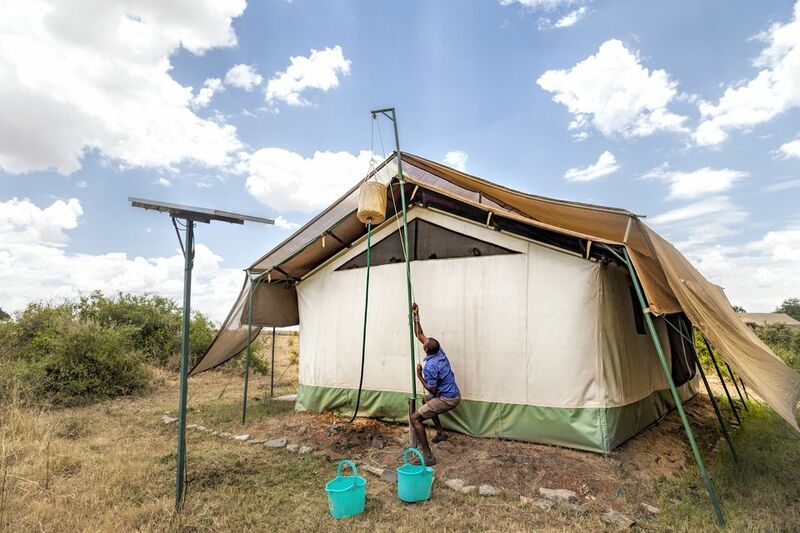 Bucket showers are also part of the experience, whether you're embarking on a self-drive camping safari or staying at an eco-lodge that prides itself on conserving precious natural resources. Bucket showers are used in remote areas with no access to running water. They come in many different guises, from the original bucket with multiple holes drilled in the bottom; to a waterproof bag with a built-in tap that allows you to control the flow of water. They can be rigged from a tree out in the open; or, if you're staying in a permanent or semi-permanent camp, they may be installed in a private shower cubicle or ensuite bathroom. Either way, a bucket shower affords a little hot water luxury in a place where a conventional shower isn't practical. How Does a Bucket Shower Work? Whatever form your bucket shower takes, the basic concept is the same. The bucket or bag is attached to a pole via a pulley system. When you want to shower, the empty bucket is lowered and filled with water that's been heated over the campfire; then raised to just above head height. Most versions that you'll encounter on safari have a shower head or tap attached, so that you can turn the water on and off at will. If you're traveling independently, you'll need to fill the bucket yourself. If you're traveling with a safari company, they will usually have camp staff to do it for you. A typical bucket shower will give you between 10 and 15 liters of water, so although you won't be able to spend in an inordinate amount of time luxuriating under the spray, you should have plenty of time to lather up, rinse off and even wash your hair. The best time to shower depends on your personal preference. Most of the time, it makes sense to shower after the last game drive of the day, since you'll only get dusty again if you decide to take a midday rinse. However, if you're traveling in winter it can get chilly quickly after the sun begins to set, so showering in the heat of the day may be the better option. When planning your shower, don't forget to factor in the time it takes for the water to heat over the fire. This is quick if the fire is already established - but much lengthier if you (or the camp staff) still have to collect firewood and get the blaze going. If you're preparing the water yourself, make sure to test the temperature before filling the bucket as there's no way to add hot or cold water once the shower starts. The mechanics of a bucket shower may be simple, but perfecting the art of enjoying one can be a little trickier. Your priority should be to make sure that the water lasts long enough for you to get clean. To do this, it's a good idea to switch the water off while you lather up, then turn it back on to rinse off. To ensure that you get a hot shower, don't wait too long to hop in. The water should be the perfect temperature when it's added to the bucket, so the longer you wait, the colder it gets. At the end of your shower, don't forget to close the tap even if there is no more water left. Otherwise, the next time you shower, the hot water will drain away before you get in. If there is water left over, make sure to drain it before your next shower so that it doesn't affect the temperature of the newly added hot water. Many safari camps recycle leftover shower water, so be sure to check before throwing it away. Lastly, remember not to drink the shower water. It may come from a nearby river or lake and almost definitely won't be potable.